A majority of the Commission's cases and restitutions are handled and achieved without publicity, at the wish of the claimants. 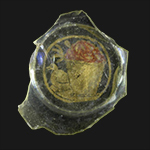 One of the Commission's publicly recorded restitutions was of the gold-glasses below. 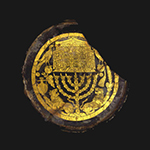 In 2008 the Commission for Looted Art in Europe negotiated the restitution from the Israel Museum Jerusalem of three gold-glass bases dating from the fourth century AD to the heirs of the Działyńska Collection at Gołuchów Castle in Poland. 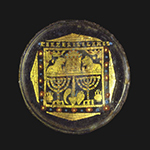 The gold-glass bases were seized by the Nazis in 1941 and their location was unknown to the family for over 60 years. For further information about our recent work, please visit our 'Press Release' section or contact us at info@lootedartcommission.com. Two case studies - the Dorotheum Case and the Glanville Case - illustrate the type of work which the Commission for Looted Art in Europe undertakes on behalf of claimants. Click on the left hand menu to read about them.